Westlake Village, CA (November 5th, 2018) - Autec Power Systems announces the release of two power supply products ready to reliably power demanding product applications despite weather and environment. 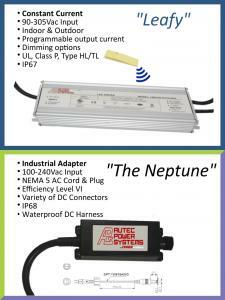 The "Leafy" LED Driver is robustly designed for outdoor LED lighting applications. This model is IP67 rated, UL Listed Class P/Type HL/TL and offered in 40W-400W models. Features include programmable output current, multiple dimming features; 0-10V/PWM/Timer/DALI/EMBEDDED DMX, and dim-to-off. The aluminum case is slim-line and linear.